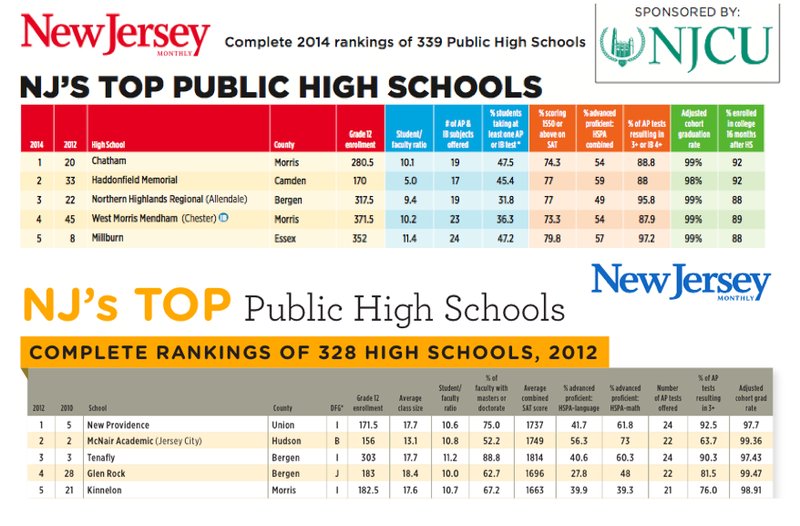 When New Jersey Monthly magazine releases its biennial high school rankings, everyone from school administrators to real estate agents eagerly scan the list to see how it can help [or hurt] them. But quite possibly, what's most important here is not what's on the chart, but what isn't. But the 2014 chart? DFG disappears. Why? Because in 2013, the state stopped reporting DFG in its “school reports cards,” replacing it with something called peer group rankings , which are not at all the same thing [more on that stupidity from Jersey Jazzman here]. Now, why would the Christie administration, which is heavily invested in blaming teachers and their unions for low test scores and poor outcomes, make such a change? Could it possibly be an attempt to obscure the otherwise obvious fact that low test scores and poor academic outcomes are closely correlated to high poverty? Could they be trying to bury the truth about this lockstep relationship in order to advance their stupid reformy idea that charters, high-stakes testing and accountability will fix what ails school districts located in pockets of deep poverty? Worse yet, why are we allowing a change in data reporting to distort the conversation, instead of focusing on the devastating effects of economic inequality on public education? The non-updating of DFGs could be something that Hudson County politicians want.